Can a Brother or Sister Get a Job in this Country? 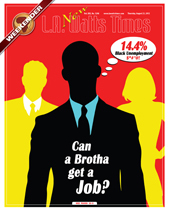 Employment for African Americans May get Worse! As the summer heat waves begin to pave way for cooler fall days, the prospects for African American unemployment is expected to get worse by the looming November elections according to the U.S. Bureau of Labor Statistics. Unemployment among Blacks rose to 14.4 percent in June, while the national rate stayed at 8.2 percent and unemployment among whites remained at 7.4 percent according to the department’s most recent figures. Hispanics held at 11 percent. However, that’s the good news compared to what job possibilities could look like nationally by the November elections where it could top 20 percent among our Black brethren. The prospects are even bleaker if your are Black, between the ages of 16 and 19 and residing in California where the figure reached an astonishing 34.8 percent according to analysis of federal data released in July. Of the 727,000 unemployed in California roughly 1 in 3 have been out of work for 52 weeks or more, as the number of unemployed swelled to 18.8 percent since last year. An estimated 497,000 Californians had exhausted all of their unemployment benefits according to the EDD, but it is unknown how many of those have secured work. These figures do not include Blacks who have become so discouraged they just quit looking for work altogether. African Americans are the most resilient people in the world by nature, having endured slavery, the bigotry of Jim Crow, segregation during the Civil Rights Movement, police brutality and continued racial discrimination, but the difficulties continue to come our way. In spite of the gloomy unemployment forecast, Blacks remain the significant barometer in economic growth potential and as a group are projected to spend $1.1 trillion by 2015 according to a report in the Louisiana Weekly. The newspaper study focused on Black spending, media habits and consumer trends, reporting an increase in the amount of Blacks attending college or earning a degree to 44 percent for men and 53 percent for women. It also detailed the rising number of African American households earning $75,000 or higher by almost 64 percent. Experts point to a number of reasons why unemployment is higher among Blacks than other ethnic groups including Chonie Sharper, CEO of Sharper Wealth Management, who says that the issue may be academic and not strictly an economic one. The National Center for Education Statistics reported the dropout rate for Blacks in 2007-’08 at a 6.7 percent compared to just 2.8 percent for whites. However, the key to African Americans improving their chances of gaining employment could rest on the shoulders of Black owned small businesses. According to Nationwide Financial, which interviewed 501 small business owners, including 200 Blacks, Black small business owners expect to increase their business by 38 percent compared to 21 percent of other small business owners. Black small business owners are also twice as likely to believe that the economy will improve in the next 12 months. Subsequently, Black small business owners are twice as likely as other owners to plan on enhancing benefits for their employees which will include providing more access to 401 (k) type plans within the next 12-24 months. The study did not explain why Black business owners had a higher level of optimism than any other group. The study should encourage more Blacks to spend their hard earned dollars with Black owned small business since they would have a better chance of being hired by one of their own. That slogan should be a mandate today considering the fatal unemployment statistics that are more humbling with each growing day.